Not to be confused with Barry Oakley. 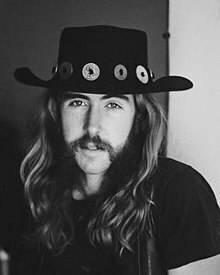 Raymond Berry Oakley III (April 4, 1948 – November 11, 1972), was an American bassist and one of the founding members of the Allman Brothers Band. He is ranked number 46 on Bass Player magazine's list of "The 100 Greatest Bass Players of All Time". Oakley was born in Chicago, Illinois, raised in the suburb of Park Forest, Illinois, then moved to Florida where he met and joined Dickey Betts's band, The Second Coming. He was a founding member of The Allman Brothers Band in 1969, along with guitarists Duane Allman and Dickey Betts, singer and keyboardist Gregg Allman, and drummers and percussionists Butch Trucks and Jai Johanny "Jaimoe" Johanson. Oakley was known for his long, melodic bass runs that formed a throbbing foundation underneath Allman and Betts' furious guitar solos and jams. "In Memory of Elizabeth Reed", "Mountain Jam" and "Whipping Post" from the live album At Fillmore East capture Oakley at his best. Oakley was also the band member most involved in establishing domestic unity among the band's extended family. When Duane Allman died in a motorcycle accident on October 29, 1971, Oakley was devastated. Oakley's bass guitar, nicknamed "The Tractor Bass", was a Fender Jazz Bass with a Guild bass pickup (manufactured by Hagström, a Swedish company). On November 11, 1972, Oakley was involved in a motorcycle accident in Macon, Georgia, just three blocks from where Duane Allman had his fatal motorcycle accident the year before. Oakley was driving around a sharp right bend of the road on Napier Avenue at Inverness when he crossed the line and collided at an angle with a city bus making the bend from the opposite direction. After striking the front and then the back of the bus, Oakley was thrown from his bike, just as Allman had been, and struck his head. Oakley said he was okay after the accident, declined medical treatment, and caught a ride home. Three hours later, he was rushed to the hospital, delirious and in pain, and died of cerebral swelling caused by a fractured skull. Attending doctors stated that even if Oakley had gone straight to the hospital from the scene of the accident, he could not have been saved. He was 24 years old when he died, the same age as his bandmate. In 1998, the Georgia state legislature passed a resolution designating a bridge on State Highway 19, in Macon, Georgia, as the 'Raymond Berry Oakley III Bridge' in "honor and remembrance" of the late founding member of the Allman Brothers Band". He is survived by his sister, Candace Rose Oakley, his widow Linda Diane Oakley Miller and daughter, Brittany Ann Oakley (whose photo appeared on the back cover of the Allmans' 1973 album, "Brothers and Sisters"). His son, Berry Duane Oakley (aka Berry Oakley Jr.) was born in March 1973. ^ "The 100 Greatest Bass Players of All Time". bassplayer.com. NewBay Media. ^ Paul, Alan (24 Feb 2015). One Way Out. New York: Macmillan. p. 192. ISBN 978-1-250-04049-7. Retrieved 15 July 2015. ^ Senator Brown,; Georgia State Senate (March 12, 1998). "SR 653 Duane Allman and Berry Oakley III Bridge – designate". State of Georgia. Archived from the original on May 22, 2009. Retrieved June 23, 2009.